NO PETS on grounds! NO DRONES! We are guests of the University of Arkansas Experimental Farm and these are strict rules. Pre-Registration/Packet Pickup Available Friday, September 21st as a convenience, not Mandatory. College and High School Teams may preview the course on Friday after 3:00 p.m.
Pre-Registration and Packet Pickup is at Race Village at the Course Friday from 5:30 PM to 7:30 PM. Cars and Buses are not allowed entry from Garland Avenue on Friday. Parking for this occasion is a grass lot on Quality Lane which intersects Gregg Street, AGRI Park off Garland or near Washington County Fairgrounds. Runners are strongly encouraged to utilize online registration to save money and time. Chile Pepper T-shirts and other event merchandise will be available for purchase. Tom Lewis 1 Mile Friday Night Pepper Dash 6:30 p.m. Home of the 12 and Under World Championship of Northwest Arkansas. Regular packet pickup at the course. While there may be rain, current conditions do not include lightning. Please avoid the course in the event of lightning. 🌧☔️⛈🌦 2018 Weather Notices Posted Here! 4201 North Shiloh Drive Fayetteville, AR 72703. A notice will be posted on website header and facebook page facebook.com/chilepepperfest early Friday morning if necessary. GPS and Google Map users: Use Washington County Fairgrounds, North McConnell Avenue, Fayetteville, AR. OR you may use AGRI Park on Garland Avenue. Don’t call for a street address because it’s in the middle of a field! There is not one! Traveling on Hwy. I-540, take exit 66 to Hwy. 112 (which is also Garland Ave.). Travel south on Hwy. 112. You will see Chile Pepper parking signs. General Parking is located at Washington County Fairgrounds which are all located off Hwy. 112. Transit Buses will shuttle participants from the parking lots to the drop-off point near the course from 5:45 a.m. to 2:30 p.m. Some walking is required. Note: Please allow extra time to get to the race site. Handicap Parking Traveling on Hwy. I-540, take exit 66 to Hwy. 112 (which is also Garland Ave.). Travel south on Hwy. 112. You will see Chile Pepper parking signs. Turn into the Agri Park and proceed up to gate entrance for Transit buses. A Deputy will check your credentials, (fill out the Handicap Parking form online). Parking is located on the course near the race village, attendants will direct vehicles. Chips will be issued on Friday and Saturday only. Each runner will be required to wear a shoe chip which will be tied to his or her shoelace with supplied bread ties. At the conclusion of each race, the chips will be collected. Each participant is responsible for returning the chip to the finish line area or registration if not participating. Please turn in the chips you don’t use or you or the school may be charged. Packets may be picked up Saturday, September 22nd, at the Festival race site at the Registration Tent beginning at 6:00 a.m. Race day registration will open at 6:00 a.m. and continue until 15 minutes prior to the start of each race. 10K Open Entry Fee: $25 before September 18, then $30 until online registration closes. Race day registration increases to $40. 5K Fun Run Entry Fee: $25 before September 18,then $30 until online registration closes. Race day registration increases to $40. VIP entry is $70, before September 18, then $80 until online registration closes or based upon availability. Benefits include a secure place for gear, preferential parking, etc. For details and updates, check the VIP Page. Each registered runner will be treated to a post-race feast provided by Jose’s and Ben E. Keith for Saturday only. Non-registered adults and kids may eat at the post-race lunch for $5. Sponsor Tents with samples, sales and surprises! 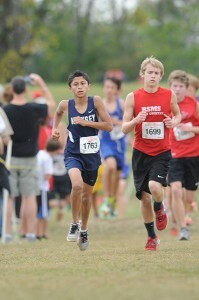 The Chile Pepper Cross Country Festival is held on the University of Arkansas cross country course in Fayetteville. The course is a combination of grass, cinder and uneven terrain. SEC and National Championships have been settled here! Coach Bucknam describes it as the Superbowl of Cross Country! Race proceeds are given to the Fayetteville, Springdale, Har-Ber, Rogers, Rogers Heritage, Siloam Springs and Bentonville, Elkins, Farmington, Gentry, Greenland, Haas Hall, Prairie Grove, and West Fork high school cross country teams. Our mission is to get kids running and over $625,000 has been given to date. $75,000 was distributed in 2017!